Juri wrote: To win end-game become more difficult. So if you get some advantage you still need to play precisely. To win the follow position you need to know some useful idea, in full-killer nothing need to know. Easly can win. I don't understand: this engame is won in regular draught and killer-light because after (16-11-7-1 and 25-30-34-39) the sacrifice 50-44 6-1 wins, but in killer 50-11 gives a draw. What was your point? In any case, your examples changed my mind about the beauty of killer-light, it requires quite some skill to think of new catching positions! The main worry remains: my estimate of draws in top-level killer would be 40-50%. I think in killer light it would be a lot higher, although of course less than with regular draughts. I think endgame databases for killer light should be made as soon as possible to determine its merits. Maybe Alex Moiseyev can enter some opinion here, eg about the parallels with checkers opening ballots (first 2-moive, then 3-move, now 11-men). Changing the rules every time human skill evolution gives 90% draws does not seem very attractive. I'd prefer a clean break and have many decades of unchanged rules after that. About that end-game. In Killer you just simply play 16-11-7-2-16 (25-30-34-39) force black to give a piece and easly win. In the light version - you need to know the useful idea. The best balance it is the main question now. To get an clear answer you can only after checking it in tournaments. I will send this post to Russian forum. I have implemented a Zillions program with the killer-light rule (i.e. killer rule is only applicable at multiple captures). It contains both a 10x10 variant and an 8x8. 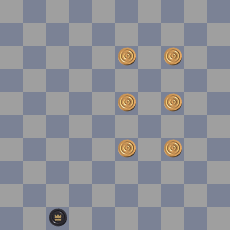 When setting up an endgame position, you can use the "empty board" variant. This is a preliminary version, not yet published. I gave it the preliminary name Modern Draughts. Please test for bugs. Rein Halbersma wrote: Maybe Alex Moiseyev can enter some opinion here, eg about the parallels with checkers opening ballots (first 2-moive, then 3-move, now 11-men). 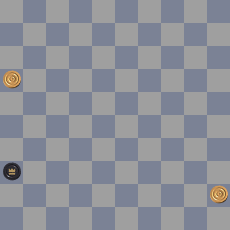 In English Draughts World title is running since 1847, more then 165 (!) years and more then any other board game like chess (1894 - Steinitz), 10x10 (1896 - Weis) etc. First matches and tournaments were in GAYP (GO-AS-YOU-PLEASE) style, or some people call it Free style. It took 50 years for players to study and master this game. 90% of existing GAYP style today was developed by 1896 when first mixed match was played (GAYP + 2 moves). Then it took another 40 years and in 1934 3-moves style was born! 11 man ballot style is different story. It was started in 1917 (If I am not mistaken) but never got a lot of attention, popularity and sponsors. No regular tournaments or matches. Last USA 11 man ballot National was played in January 16-18 2016 in Burlington, NC where I was first and Kentucky grandmaster Jim Morrison was 2nd and earned rights to play a World Title match with me (hopefully late this year). 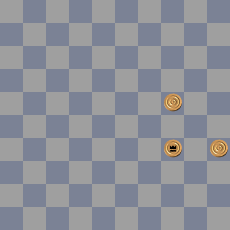 This style removes one man from each side on the 3d & 2nd row + one move for each side is selected randomly. This generates 8x8x7x7 = 3,156 openings but some of them are the same. Number of different openings - 2,500- no published play allow !! I am proud to say that I still owe world champion title in this style. Back to topic - I don't think playing 2, or 3 moves restrictions change the game. Rules are the same, endings are the same, strategy principals and "golden rules" are the same. If we want to raise chances of wins, we can play something similar to Armagedon - less time etc. 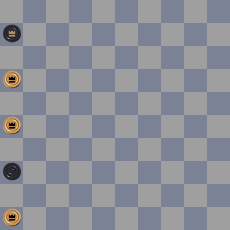 I am totally against any idea to change game rules - either English Draughts or 10x10. There are many, many ways to change rules, it will be just different game, not draughts which we know. There are many games, but I have one life only and am OK with game I like and enjoy. 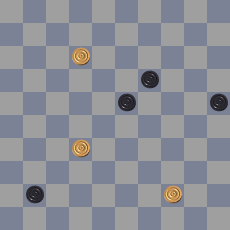 There is always something around the corner in the game of Draughts ! What is the difference with +\- draws. Anyway it is a draw, so it only has influence on additional criterions. And to fight for plus your idea is to bring as more pieces to a king and count points. Everyone understand that he will get 1 point in ranking, so to play for + it is very unpleasant in such situation. I don't know anyone top-player who likes it. But with light-killer - you are fighting for full 2 points. take a look at this end-game. seems it is winning. but to realise it you need to know two important things: catching constraction for a king and to win a move. Basic knowledge. The connection with reality still exist. In "full-killer" it is totally a new reality of end-games. In full-killer you spend the most of your energy in positions occur before end-game. 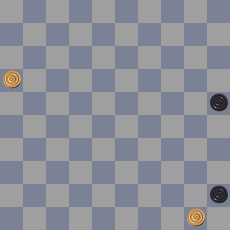 "An important defensive property of draughts is to enter a drawn endgame. 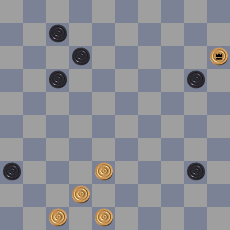 This is no longer possible in killer draughts. However, if only 3 against 1 is a win, this defensive property is retained, to a degree. Arguably, it is important to retain such a defensive stratagem, because it makes the game deeper and more interesting." Juri wrote: These are good words. Without examp!es, words are empty What happens with classical 10x10 middle game positions like Woldouby, DeHaas-Fabre etc that are narrowly drawn in regular draughts, but easily won with killer. If they are winning for killer-light, then that would be encouraging. Rein Halbersma wrote: Without examp!es, words are empty What happens with classical 10x10 middle game positions like Woldouby, DeHaas-Fabre etc that are narrowly drawn in regular draughts, but easily won with killer. If they are winning for killer-light, then that would be encouraging. You can test this with my new killer-light program, here (requires Zillions, downloadable at $25). Some discussion on Russian forum is in a process. Because they are near in a question of draw estimation. 1) "light-killer". change only One rule, so easy to apply. The winer gets the full 2 points - spectators, reporters, sponsors are happy. 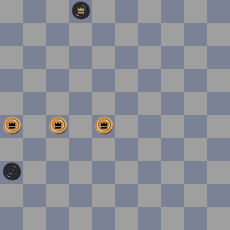 The game gets minimal changes, but real advantage as 3 kings against 1 - is a victory. It is also a very big step. Might be some differences in a tactic using a new rule. 2) Delft-System used different way of counting points (5-0, 3-1, 2-2). But the real winner we will not get. Opponent still have moving king and can continue to play, the points are adjudged by rule. It is a big minus. In total the system is fair. 3) +\-. It is just additional criterie, main points are not changed. So dont have any influence to a play. "full-killer" it is different, cannot compare. Some likeness you can find in Zeeland Open, where advantage of 1 piece is counted as 0,1, so the draw can be - 1,01 - 0,99.
then 4540! and white gets + 0,1 points draw in Zeeland or win in Full-killer. But it is funny, that end-games 1 king against 2 pieces, like on the last pic - could be winning, draw or even losing! To estimate what is it "Light-killer" or "Modern draughts" you can watch last WC where used +\- draws. More or less it is similar. and to watch games of A. Chizhov from WC-2011 where he got 7 pluses! Juri wrote: To estimate what is it "Light-killer" or "Modern draughts" you can watch last WC where used +\- draws. More or less it is similar. In the last Match Georgiev-Ndjofang they have played 7 games in normal time control, all finished in a draw. But in light-killer 1 or even more could be winning by Ndjofang (but not too much too). after 43...2025 if 44.4741, 3833 - black have a chance to win. and other games even in Full-killer not sure about result. On russian forum there are a lot of opponents "killer-changes". So to introduce it would be not easy. Last edited by Juri on Fri Feb 12, 2016 17:36, edited 2 times in total. Juri wrote: On russian forum there are a lot of opponents "killer-changes". It is the same in the Netherlands. People who have invested a lot of energy in 1 game, do not like to throw that away, even if the game is not perfect. in 1923 William BEAUREGARD won Benedictus SPRINGER: 10 games - 5 draws. Frankly speaking, a lot of people also like idea of Killer. but they thinking that Killer even with minimal changes - it would be a new game, so it can not replace classical draughts. And only the way - a parallel co-existence. the same as GAYP and 3-moves opening lottery in english checkers, classical and flying-openings in russian 64. Minuses of killer - no difficult king-endgames.. But something instead of it can appear. If the first time it would be well perfomed - than have chances in future. and I think, For the first time in order to get the maximum value - better to use the full-killer with 2 kings win 1.
now we have Turkey and Swiss king capture in draughts. About co-existence: in general, yes, it is probably necessary to ease the transition for current club-level players. But not for top-level tournaments. The draw-problem requires a radical change: Killer with 2 vs 1 wins. Draw in regular draughts, win in Killer. Result in Killer-light? Similarly, it would be nice if 10x10 classical late middle game positions like Woldouby, De Haas-Fabre and Sijbrands-Hisard would win in Killer-light. If not, then it probably would not lower the drawing margin enough for top-level draughts. 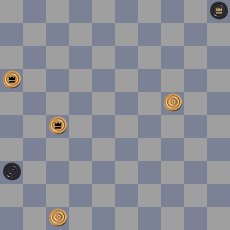 About no difficult king-endgames: the difficulty is shifted to smaller endgames. 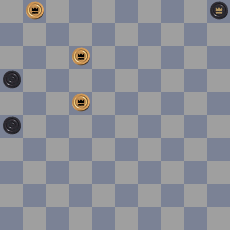 Instead of 4 vs 2 and 5 vs 3, you have very difficult 3 vs 3 endgames with 1 king each or 2 kings each. And the late middle game is much more difficult in killer. What did you mean with Swiss king capture? Question is if piece on 20 or 15? 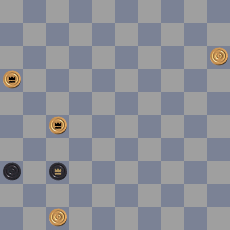 In 64 draughts is used the idea to sacrifice a king and promote 15 into a king. then bring 47 into a third king. Famous classical positions have to be winning in light-killer too, very big advantage is there. 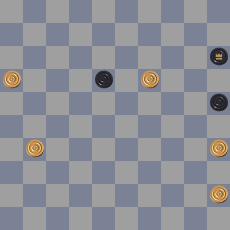 Swiss capture is: when the king making a capturing, it cannot jump via the same piece twice. Look like this construction is winning. Ideas are very similar to 64.